Andalucia Homes: ***Large and luxurious 2 story pool home in the beautiful gated community of Andalucia*** SERENE VIEWS! Large granite kitchen, breakfast bar, walk-in pantry and a BUTLER'S KITCHEN! Beautiful hardwood and tile work throughout. 4 bedrooms and 3 full baths. OVERSIZED MASTER BATH and "his and hers" closets! Huge upstairs laundry room with lots of STORAGE! Many beautiful upgrades in this home including solid core doors in each room, tray ceilings and more! This home is *PERFECT* for entertaining. *LOW HOA DUES*! Andalucia Homes: Beautiful 3 bedroom plus den 3 baths home with long, private preserve views. Like new mint condition and move-in ready. This home boasts many expensive upgrades to include hardwood flooring, custom luxurious kitchen with solid wood cabinetry, quartz countertops, stainless steel appliances, crown molding, designer all LED lighting and fans, plantation shutters, and hurricane shutters. One of the lowest HOA fees in Naples for a gated community with a nicely updated clubhouse, resort-style lap pool, fitness center, and kids play area. Prime North Naples location West of I-75. 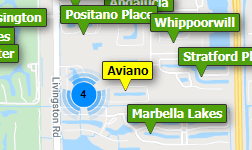 Close to shopping, dining, and Naples pristine beaches. See today! Andalucia Homes: Beautiful 3 bedroom + den / 3.5 bathroom POOL home with an AMAZING lake view! Spacious is an understatement with over 2600 sq. ft. of living space and high ceilings. A large master bedroom on the first floor features an impressive master bathroom with a walk in shower, walk in closet, oversized bathtub, and dual sinks. A large laundry room is located on the first floor, along with a guest bathroom. Upstairs features two bedrooms (one with a private balcony) and two bathrooms, along with an additional living space. Andalucia is a gated community with wonderful amenities including clubhouse, pool, and playground for children. Andalucia Homes: One of the best long water views in Andalucia. This spacious and stylish Seville model features an open and contemporary floor plan with four bedrooms, three bathrooms, and a two car garage. Simply elegant this home features a master bedroom with a spectacular en-suite, a superb kitchen that flows through to the living room, a sizable dining room, a fourth bedroom could be converted to a den with or sitting room/home office. The home has a laundry room and a wonderful outdoor living space that includes a lanai with a pool. The home is perfect for entertaining and family gatherings. Ideally located in Naples for enjoying leisurely pursuits, cafes, and fine dining restaurants, boutique shopping, white sandy beaches, golf, boating, attractions, first-class health care, as well as a fusion of premier amenities. A perfect home for year round living, a winter retreat for seasonal living, or a haven for an occasional getaway. This home is a must see. Andalucia Homes: Arabella floor plan, wonderful 3 bedroom with a gourmet kitchen, beautiful granite countertops, new top of the line stainless steel appliances, tile throughout in living areas, hardwood flooring in bedrooms, new ceiling fans, new ac. Private pool and just steps away from the community amenities. Elegant community clubhouse features a fully equipped exercise room, gathering room, large pool with lap lanes, separate spa, play and basketball areas. This architecturally pleasing gated community boasts an excellent location close to great schools and is minutes from fabulous beaches, world class shopping and easy access to I75. Andalucia Homes: H.14273 - READY FOR YOU TO MOVE IN! Great open floor plan is perfect for entertaining or for every day living. Island kitchen with granite counters and stainless appliances. Walk-in pantry. Custom feature wall. Tray ceilings with crown molding in bedrooms and great room. Plenty of separation between large bedrooms allows for maximum privacy. Rich laminate flooring in common areas. Neutral colors throughout. Screened lanai with outdoor kitchen and pool. Andalucia is a small gated community of only 167 single family homes. Bus picks up kids right outside the gate to deliver them to all A-rated schools. Coveted newer construction west of I-75. Nice community pool, exercise room and clubhouse with very low fees! Easy to see on short notice!